The sixth tactical implication identified in the Underwriters Laboratories study of the Impact of Ventilation on Fire Behavior in Legacy and Contemporary Residential Construction (Kerber, 2011) identifies potential hazards and risks related to the tactic of Vent Enter Search (VES). Kerber (2011) provides a straightforward explanation of this tactic. While it is difficult to identify or isolate the origins of many fireground tactics, VES has been practiced by FDNY for many years and is described in detail in the Firefighting Procedures Volume 3, Book 4: Ladder Company Operations at Private Dwellings manual (FDNY, 1997). As described in Ladder Company Operations at Private Dwellings, FDNY truck companies are staffed with an officer, apparatus operator, and four firefighters and are divided into two teams; inside team and outside team. While tactics are dependent on the type of structure and fire conditions; VES is performed by the outside team while the inside team works in conjunction with an engine company, supporting fire attack and searching from the interior. In this context, VES is part of a coordinated tactical operation. It is also important to recognize the impact of changes in the fire environment since the development of this tactic (likely in the 1960s). Changes in the speed of fire development are graphically illustrated in the Underwriters Laboratories (UL) test of fire development with modern and legacy furnishings. 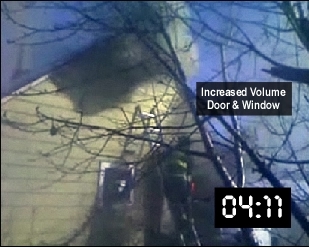 The tremendous fuel load, development of ventilation limited conditions, and rapid transition from tenable to untenable conditions for firefighters following increased ventilation (without initiation of fire control), reduce the time for Firefighters to make entry and control the door when performing VES in the modern fire environment. The following incident illustrates the rapid changes in conditions that can result during VES operations. This information was originally presented in the post titled Criticism Versus Critical Thinking. This incident involved VES at a residential structure where rapid fire progress required the Captain conducting the search to perform emergency window egress from a second floor window onto a ladder. Companies were dispatched to a residential fire at 0400 hours with persons reported. On arrival, cars were observed in the driveway and neighbors reported the likely location of a trapped occupant on the second floor. Given fire conditions on Floor 1, the Captain of the first in truck, a 23 year veteran, determined that Vent, Enter, and Search (VES) was the best option to quickly search and effect a rescue. When we vent[ed] the window with the ladder, it looks like the room is burning, but the flames you see are coming from the hallway, and entering through the top of the bedroom doorway. Watch it again and you’ll see the fire keeps rolling in and across the ceiling. When I get to the window sill, the queen-sized bed is directly against the window wall, so there is no way to “check the floor” … Notice that you continue to see my feet going in, because I’m on the bed. My goal was to get to the door and close it, just like VES is supposed to be done. We do it successfully all the time. When I reached the other side of the bed, I dropped to the floor and began trying to close the door. Unfortunately, due to debris on the floor, the door would not close [emphasis added]. There have been instances where VES has resulted in saving of civilian life. There have been instances where VES has resulted in significant thermal injury to firefighters. The UL ventilation tests (Kerber, 2011) demonstrate that conditions rapidly become untenable for civilian occupants in rooms with open doors. Rooms with closed doors remain tenable for civilian occupants for a considerable time. VES may result in rapid search of specific threatened areas. VES is a high risk tactic that involves working alone (but if a second firefighter remains at the entry point this is similar to oriented search). VES (as normally practiced) involves working without a hoseline. As demonstrated in the UL ventilation tests (Kerber, 2011), thermal conditions change from a tenable operating environment for firefighters to untenable and life threatening in a matter of seconds. Based on these factors, you may determine that VES is not an appropriate tactic for primary search under any circumstances, or you may determine that it might be appropriate under specific circumstances. The following tactical scenarios may provide a framework for discussion of these issues. Scenario 1:You have responded to a fire in a medium sized, two-story, wood frame, single-family dwelling at 02:13 hours. You observe a smoke issuing at moderate velocity from the eaves and condensed pyrolizate on the inside of window glazing. A dull reddish glow can be observed through several adjacent windows on the Charlie Side (back of the house), Floor 1. Given your normal first alarm assignment and staffing Is VES an appropriate option for primary search given the conditions described and potential for possible occupants? Why or why not? Scenario 2: You have the same building, smoke, air track, heat, and flame indicators as in Scenario 1, but a female occupant meets you on arrival and reports that her husband is trying to rescue their daughter who was sleeping in a bedroom on Floor 2 at the Alpha/Bravo corner of the house. Given your normal first alarm assignment and staffing Is VES an appropriate option for primary search given the conditions described and reported occupants? Why or why not? Scenario 3: You have the same building, smoke, air track, heat, and flame indicators as in Scenario 1, and observe two occupants, an adult male and a female child in a window on Floor 2 at the Alpha/Bravo corner of the house. Smoke at low velocity is issuing from the open window above the occupants. However, before you can raise a ladder to rescue the occupants in the window, they disappear from view and the volume and velocity of smoke discharge from the window increases. Given your normal first alarm assignment and staffing Is VES an appropriate option for primary search given the conditions described and initial observation of occupants? Why or why not? UL has commenced a study on the Effectiveness of Vertical Ventilation and Fire Suppression Tactics using the same legacy and contemporary residential structures used in their study of horizontal ventilation. This research project will examine a range of vertical ventilation variables including the size, location, and timing of openings. In addition, further research will be conducted on the effectiveness of exterior streams and their impact on interior conditions. Full scale tests are anticipated to begin in January 2012. I will provide updates as this research project progresses. Fire Department of the City of New York (FDNY). (1997) Firefighting prodedures volume 3 book 4: Ladder company operations at private dwellings. New York: Author. Safe & Effective Live Fire Training or Near Miss? A recent video posted on the firevideo.net [http://firecamera.net/] web brought to mind a number of painful lessons learned regarding live fire training in acquired structures. When watching video of fire training or emergency incidents, it is essential to remember that video provides only one view of the events. This video, titled Probationary Live House Burn shows a live fire evolution from ignition through fire attack with the comment “Burnin up the probies… LOL”. 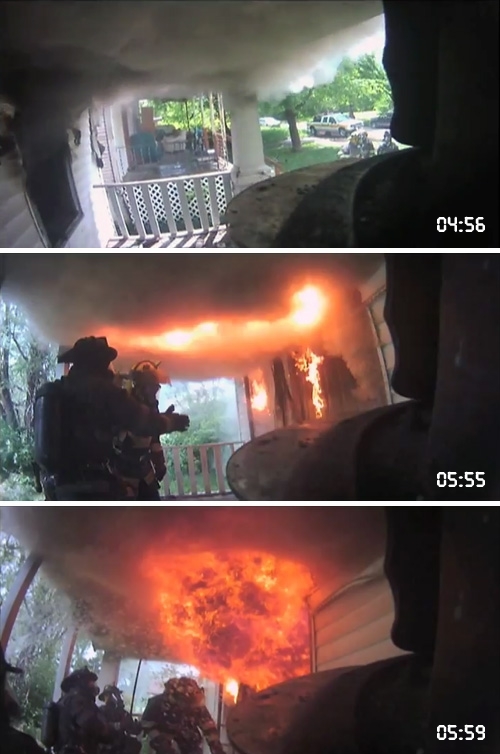 This video shows multiple fire locations and an extremely substantial fire load (well in excess of what is necessary to bring typical residential compartments to flashover). I am uncertain if the comment posted with the video “burnin up the probies…LOL [laughing out loud]” was posted by an instructor or learner. Likely this is considered as just a joke, but comments like this point to our collective cultural challenges in providing safe and effective live fire training. NFPA 1403 Standard on Live Fire Training is reasonably explicit regarding the nature of acceptable fuel, extent of fuel load, as well as number and location of fires used for live fire training in acquired structures. 4.3.1 The fuels that are utilized in live fire training evolutions shall have known burning characteristics that are as controllable as possible. 4.2.17 Combustible materials, other than those intended for the live fire training evolution, shall be removed or stored in a protected area to preclude accidental ignition. 4.3.3* Pressure-treated wood, rubber, and plastic, and straw or hay treated with pesticides or harmful chemicals shall not be used. A.4.3.3 Acceptable Class A materials include pine excelsior, wooden pallets, straw, hay, and other ordinary combustibles. Fuel materials shall be used only in the amounts necessary to create the desired fire size. A.4.3.4 An excessive fuel load can contribute to conditions that create unusually dangerous fire behavior. This can jeopardize structural stability, egress, and the safety of participants. 4.3.5 The fuel load shall be limited to avoid conditions that could cause an uncontrolled flashover or backdraft. 4.4.15 Only one fire at a time shall be permitted within an acquired structure. 4.4.16 Fires shall not be located in any designated exit paths. In addition, the arrangement of the initial materials to be ignited, particularly the proximity to walls and ceilings, and the ventilation openings [emphasis added] are important factors to be considered when assessing the potential fire growth. The building in this video appeared to have been used for multiple evolutions prior to the one depicted in the video. A number of the windows appeared to be damaged, providing increased ventilation to support combustion. The fuel load of multiple pallets and excelsior or straw (acceptable types of fuel) provided an excess of fuel required to reach flashover in typical residential rooms (which may have been an intended outcome and level of involvement given the transitional attack (defense to offense)). If in fact the sets were in multiple rooms, this would be inconsistent with the provisions of NFPA 1403 limiting acquired structure evolutions to a single fire. It is essential for those of us who conduct live fire training to remember that most of the provisions of NFPA 1403 (2007) are based on line-of-duty deaths of our brothers and sisters. 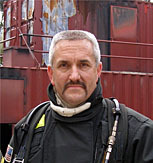 Safe and effective live fire training requires that instructors be technically competent, well versed in the requirements or relevant regulations and standards, and that individually and organizationally we have an appropriate attitude towards safe and effective learning and the process of passing on the craft of firefighting. 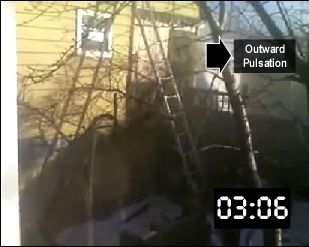 At 4:56 in the video, accumulation of a layer of smoke is clearly visible under the porch roof. No comment is made about this by the instructors and no action is taken to mitigate the hazard. At 5:55, flames exiting a broken window to the left of the door ignite the smoke layer just prior to when the attack team opens the door. It is essential to recognize that smoke is fuel and that ignition of this gas phase fuel overhead results in a rapid and signfiicant increase in radiant heat flux (which is dependent largely on temperature and proximity). Cooling the gases overhead and use of good door entry technique can minimize risk of this thermal insult to firefighters and potential for transition to other types of extreme fire behavior such as flashover. This video also shows some interesting aspects of fire stream application. A solid (or straight) stream can be quite effective in making a direct attack on the fire. However, when the fire is shielded, the effectiveness of this type of stream is limited. While limited steam production is often cited as an advantage of solid (and straight) streams, initial application of water through the doorway in this video results in significant steam production and limited effect on the fire. This is likely due to shielding of the burning fuel by interior configuration and compartmentation. Remember than no single type of fire stream is effective for all applications. Consider the question posed in the title of this post: Was this a safe and effective live fire training session or a near miss? I suspect that the learners in the video enjoyed this live fire training session and that the instructors desired to provide a quality learning experience. It is even likely that this evolution was conducted substantively (but likely not completely) in compliance with the provisions of NFPA 1403. Like most training exercises and emergency incidents, it is easy to watch a video and criticize the actions of those involved. I do not question the intent of those involved in this training exercise, but point to some issues that we (all of us) need to consider and reflect on as we go about our work and pass on the craft to subsequent generations of firefighters. I am working hard at getting back into a regular rhythm of posting and hope to have a post looking at another of the Tactical Considerations from the UL ventilation study up within the next week. National Fire Protection Association. (2007). NFPA 1403 Standard on live fire training. Quincy, MA: Author. Shimer, R. (2007) Independent investigation report: Baltimore city fire department live fire training exercise 145 South Calverton Road February 9, 2007. Retrieved February 19, 2009 from http://www.firefighterclosecalls.com/pdf/BaltimoreTrainingLODDFinalReport82307.pdf. There were multiple near miss incidents and injuries involving flashover during the month of December. These incidents point to the importance of understanding fire dynamics and reading the fire as part of initial size-up and ongoing dynamic risk assessment. Each member operating on the fireground must maintain a high level of situational awareness and communicate key fire behavior indicators and potential for extreme fire behavior phenomena. Firefighters attempting to rescue a victim from a burning Portsmouth (VA) house on Thursday were forced to abandon the rescue attempt and exit a window when a flashover occurred. Firefighters first entered the home through the front door, but were repelled by flames. They then made entrance through the front bedroom windows when the flashover occurred. After escaping, firefighters tried to reenter through the back of the house, but they could not. “An Ottawa firefighter had to be rescued from a burning basement after he was caught in a possible flashover yesterday afternoon. We don’t know what happened, and we haven’t had a chance yet to look into exactly what the details were, but we have a feeling that it might have been a flashover,” department spokesman Marc Messier said. “Flames were coming up from the basement and out of the windows when crews arrived at the Dana Avenue house fire. There was a flashover, and fire crews quickly evacuated the duplex. Two firefighters were injured in the flashover, Battalion Chief David Whiting” said. When they arrived, flames were coming from the first and second story of the house, firefighters said. Kansas City Fire Chief Smokey Dyer said crews went inside and started to go up the stairs, when conditions inside the house suddenly changed. He said it burned the fire hose and left the firefighters completely surrounded by flames. The firefighters sent out a mayday call for help. “In the past 10 years, every significant firefighter injury that we have sustained in fire combat has been a result of a rapid change of conditions,” [emphasis added] Dyer said. Incidents such as these point to the need for continued emphasis on developing firefighters’ understanding of practical fire dynamics and effective strategies and tactics to control the fire environment and prevent, rather than react to occurrence of fire phenomena such as flashover. In a recent discussion with a number of international colleagues, we were challenged to think about language, terminology, and precision when describing fire phenomena. While this is a more obvious challenge when working with firefighters, researchers, and scientists who have different first languages, it is also a day to day problem for firefighters with a common native language (e.g., English). I have previously raised this question and proposed one approach as a starting point for classification of fire behavior phenomena based on outcome and the conditions required for the phenomena to occur (Language & Understanding: Extreme Fire Behavior and Extreme Fire Behavior: An Organizing Scheme). Stage of fire transition to a state of total surface involvement in a fire of combustible materials within an enclosure’ (ISO 13943, 2008, 4.156). This transition is often assumed (and in many cases explicitly stated) to take place between the growth and fully developed stages. However, neither the ISO nor NFPA definition specifies this. In addition, while the NFPA definition indicates that this transition is extremely rapid (i.e., more or less simultaneously), the ISO definition does not describe the speed with which the transition to total surface involvement occurs. In some respects, flashover is always a transition between the growth and fully developed stage (as increasing heat release rate is necessary). However, this may be a bit misleading. In the modern fire environment a compartment fire may follow an alternate path, often transitioning from growth to decay prior to flashover due to limited ventilation as illustrated in Figure 1. 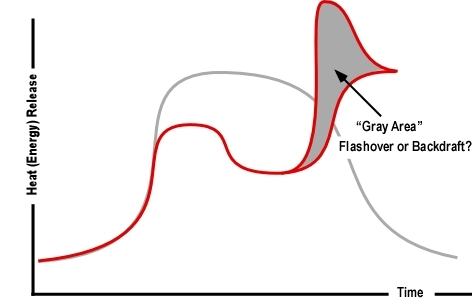 As illustrated in Figure 1, the traditional fire development curve shows fire progressing neatly through incipient and growth stages, with occurrence of flashover resulting in transition to the fully developed stage and then decay as fuel is consumed. The path of fire development is often quite different in the modern fire environment. The nature of common building contents provides a rapid increase in heat release rate (HRR) and corresponding oxygen consumption, resulting in the fire becoming ventilation controlled. With heat release limited by ventilation, the fire begins to decay (HRR and temperature are reduced). Uninterrupted this may cause the fire to self-extinguish. However, should an opening be created (as a result of window failure due to fire effects or opening of a door), the fire re-enters the growth stage and transitions through flashover to the fully developed stage. This is sometimes described as ventilation induced flashover (but in some respects, flashover is simply flashover). In a spirited debate, some of my international colleagues have stated that “all flashover is ventilation induced” as ventilation is necessary to develop sufficient HRR for flashover to occur. Others have said that “flashover is temperature driven” as sufficient upper layer temperature is required. None have specifically said that flashover is a fuel dependent phenomenon, but this is true as well (given that the fuel that is burning must have sufficient energy and heat release rate for flashover to occur). In addition, flashover is dependent on compartment size and configuration, as a given fire will reach flashover in one compartment (generally a smaller one) and not in another). So, what’s the answer? It Depends! This really boils down to being able to recognize what is important for firefighters to understand about fire development and flashover (as well as other extreme (i.e., extremely rapid changes in) fire behavior. Fire behavior is completely predictable if you have the necessary information and the time to analyze it (but on the fireground you seldom do). Predicting fire behavior is really saying: This is what I think is likely to happen. Changes in the built environment have influenced fire development (but there are a number of variables that may vary from nation to nation). In the US, modern building contents have increased heat of combustion and heat release rate, resulting in more rapid fire development than in the past. If ventilation is adequate, the typical room (e.g., bedroom, living room, family room) has well in excess of the amount of fuel (both in heat of combustion and peak heat release rate) to allow a fire to progress to flashover. Smoke is fuel. This is not dependent on the size or occupancy of the building. Smoke always presents a potential flammability hazard and as the concentration of fuel and energy in the smoke increases (think temperature, even though this is not the same as energy), the hazard increases. When a compartment fire becomes ventilation controlled, pyrolysis continues, adding additional gas phase fuel to the smoke in the upper layer. Building configuration and ventilation profile has a significant impact on fire development. However, despite increased compartment size and open floor plans, fires in modern single family dwellings are likely to be ventilation controlled when the fire department arrives. Increasing the air supplied to a ventilation controlled fire will result in an increased heat release rate (unless you immediately put the fire out) and this can occur quickly. Where you ventilate in relation to the fire, the existing heat release rate, and energy in the upper layer will all influence how quickly these changes occur. Creating an opening for entry is ventilation! This change in the ventilation profile often influences development of ventilation controlled fires by increasing air supply and providing a flow path for fire travel from the current area of involvement to the entry point (watch for a bi-directional air track with air in at the bottom and smoke out at the top of the opening). Adding additional openings will further increase the HRR and speed fire growth (unless you put the fire out). This is true even if the openings are near the seat of the fire. It is unlikely that you can tactically create sufficient ventilation to return a ventilation controlled fire to a fuel controlled burning regime (meaning that as you continue to increase ventilation, HRR will continue to rise). This does not mean that ventilation is bad as you may influence fire spread and the level of the upper layer, but recognize that the fire will get larger (increased HRR). Wind can have a significant influence on fire behavior. Consider wind direction, velocity, and how fire behavior (e.g., HRR, flow path) may change if the ventilation profile changes. Given what we know, how should this inform our choice of strategies and tactics? Remember that strategies and tactics are context dependent. If you arrive with a single resource and two firefighters, your capabilities are different than if you arrive with six resources and 24 firefighters. Resources change some of your tactical options and the potential for concurrent operations. However, resources and their capability do not change the chemistry and physics of fire dynamics. It is important to recognize potential fire behavior, the scope and magnitude of the problems presented by the incident and the capabilities of the resources at hand. Recognize the indicators of flashover potential and communicate these observations to the members of your crew. Company officers (crew/team leaders) should communicate observation of flashover indicators to their immediate supervisor (e.g., Command, Division or Group Supervisor). Ensure that fire attack (or any other operation that involves working inside a burning building) and tactical ventilation is coordinated. In more explicit terms this means that ventilation occurs when companies or crews assigned to fire attack can quickly put water on the fire (not when they are ready to call for water or are simply ready to enter the building). Ensure that you are working on a hoseline (or are protected by one) if you are working in a smoke filled environment. Without a charged hoseline you have no defense (you cannot outrun flashover or other rapid fire development phenomena). Take positive actions to reduce the threat. If there are hot gases overhead, cool them. If you can put water directly on the fire, do it. If you put the fire out, things will generally improve! When you can control the fire ventilate to remove the smoke and remove the hazard. Consider the effects of wind on potential fire behavior. Consider exterior attack and avoid advancing lines in the potential flow path when the potential for wind driven fire conditions exits. Use caution when entering from the windward side and control inlet openings (or provide adequate exhaust). Clearly understand when you are taking a reasonable and calculated risk and when you are gambling. Think about this before you are engaged in a firefight. Make it a conscious decision and not simply a default choice. Field Marshal Erwin Rommel made this distinction between taking risks and gambling: “With a risk, if it doesn’t work, you have the means to recover from it. With a gamble, if it doesn’t work you do not. Normally, to succeed you must take risks. On occasion you have to make a gamble” (Clancy, 1997, p. 152). My next post will dig into the findings and tactical implications of the recently released research results and on-line training program from Underwriters Laboratories (UL): Impact of Ventilation on Fire Behavior in Legacy and Contemporary Residential Construction. This training program is of critical importance to anyone fighting fires in today’s buildings. All firefighters and fire officers should complete this training program before the end of January 2011! Take the time and get your head around the implications of this research on what we do on the fireground. This takes a bit of effort as we need to question our assumptions and standard practices, but the outcome is worth the work. Be a student of our craft, be safe and look out for the firefighters and fire officer that work with you. Have a great New Year! I recently traveled to Peru to deliver a presentation on 3D Firefighting at the First International Congress on Emergency First Response which was conducted by the Cuerpo General de Bomberos Voluntarios del Perú. This congress was being conducted in conjunction with the Peruvian fire service’s 150th anniversary celebration (establishment of Unión Chalaca No. 1, the first fire company). In addition to my conference presentation, I spent 10 days teaching fire behavior and working alongside the Bomberos of Lima No.4, San Isidro No. 100, and Salvadora Lima No. 10. Lima is a city of 8 million people served by a volunteer fire service which provides fire protection, emergency medical services, hazmat response, and urban search and rescue. The stations that I worked in were busy with call volumes from 2000 to 5000 responses in an urban environment ranging from modern high-rise buildings to poor inner city neighborhoods. Each station was equipped with an engine, truck, rescue, and ambulance. Staffing varied throughout the day with some units being cross staffed or un-staffed due to limited staffing. At other times, units were fully staffed (5-6 on engines and trucks, 4 on rescues, and 3 on ambulances). While the Peruvian fire service has some new apparatus, many apparatus are old and suffer from frequent mechanical breakdown. Faced with high call volume and old apparatus and equipment, the Firefighters and Officers displayed a tremendous commitment to serve their community. The firefighters I encountered had a tremendous thirst for knowledge and commitment to learning. My friend Giancarlo had arranged for a short presentation on fire behavior for a Tuesday evening and the room was packed. Class was scheduled from 20:00 until 22:00. However, when we reached 22:00, the firefighters wanted to stay and continue class. We adjourned at 24:00. This continued for the next two nights. Sunday, between calls, we had breakfast at San Isidro No. 100 and then conducted a hands-on training session on nozzle techniques and hose handling. At the start of class, Firefighter Adryam Zamora from Santiago Apostol No. 134, related that he used the 3D techniques we had discussed in class at an apartment fire the night before with great success. Staff rides began with the Prussian Army in the mid-1800s and are used extensively by the US Army and the US Marine Corps. A staff ride consists of systematic preliminary study of a selected campaign or battle, an extensive visit to the actual sites associated with that campaign, and an opportunity to integrate the lessons derived from these elements. The intent of a staff ride is to put participants in the shoes of the decision makers on a historical incident in order to learn for the future. Wildland firefighters have adapted the staff ride concept and have used it extensively to study large wildland fires, fatalities, and near miss incidents. However, structural firefighters have not as commonly used this approach to learning from the past. 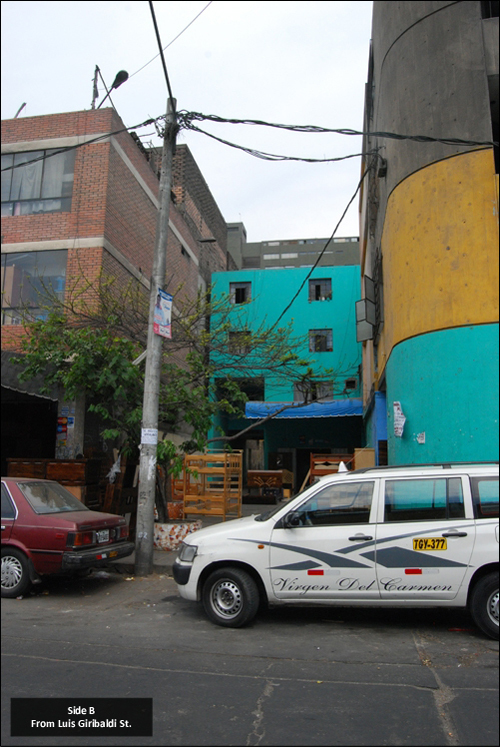 When I traveled to Lima, I only knew two Peruvians; Teniente Brigadier CBP (a rank similar to Battalion Chief in the US fire service) Giancarlo Passalaqua and Teniente CBP (Lieutenant) Daniel Bacigalupo. However, I left Lima with a much larger family with many more brothers and sisters. Many firefighters have seen the following video of an extreme fire behavior event that occurred in Lima, Peru. This video clip often creates considerable discussion regarding the type of fire behavior event involved and exactly how this might have occurred. Photos and video of fire behavior are a useful tool in developing your understanding and developing skill in reading the fire. However, they generally provide a limited view of the structure, fire conditions, and incident operations. 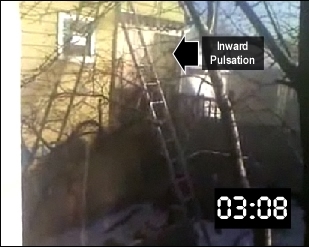 Note: While not specified in the narrative, this video is comprised of segments from various points from fairly early in the incident (see Figure 3, to later in the incident immediately before, during, and after the backdraft). 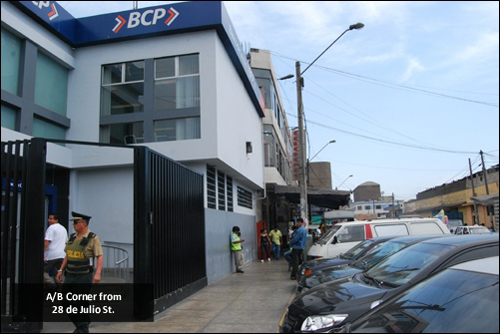 When I was invited to Lima, I asked my friend Teniente Brigadier CBP Giancarlo Passalaqua who worked at this incident, if it would be possible to talk to other firefighters who were there and to walk the ground around the building to gain additional insight into this incident. The morning after I arrived, I was sitting in the kitchen of San Isidro No. 100 and was joined in a cup of coffee by Oscar Ruiz, a friendly and engaging man in civilian clothing who I assumed was a volunteer firefighter at the station. After my friend Giancarlo arrived, he told me that Oscar was actually Brigadier CBP (Deputy Chief) Oscar Ruiz from Lima No. 4 and one of the two firefighters who had been in the bucket of the Snorkel pictured in the video. Oscar and I had several opportunities to spend time together over the course of my visit and he shared several observations and insights into this incident. 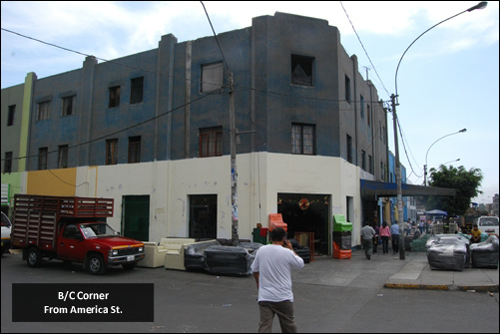 At 11:00 hours on Saturday, March 15, 1997, two engines, a ladder, heavy rescue, medic unit, and command officer from the Lima Fire Department were dispatched to a reported commercial fire at the intersection of Luis Giribaldi Street and 28 de Julio Street in the Victoria section of Lima. 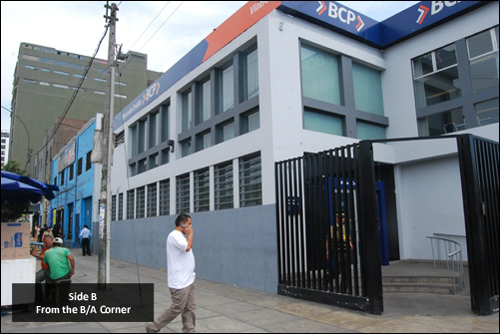 Companies arrived to find a well developed fire on Floor 2 of a 42 m x 59 m (138’ x 194’) three-story, fire resistive commercial building, The structure contained multiple, commercial occupancies on Side A (Luis Giribaldi Street) and Side B (28 De Julio Street). 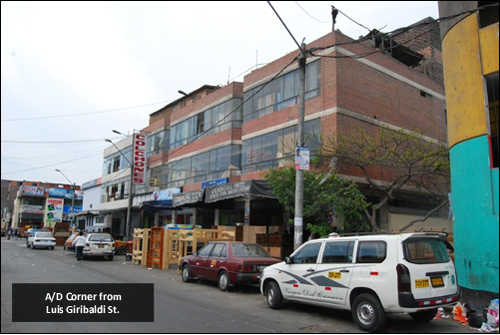 Floors 2 and 3 were used as a warehouse for fabric (not as a plastics factory as reported in the video clip). 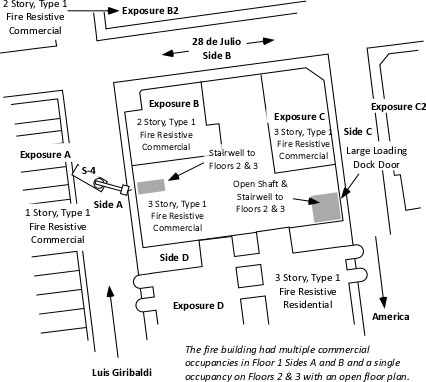 The building was irregularly shaped with attached exposures on Sides B and C.
Exposure A was a complex of single-story commercial occupancies, Exposure B was an attached two-story commercial complex, Exposure C was an attached three story commercial complex, and Exposure D was a three story apartment building. All of the exposures were of fire resistive construction. Floors 2 and 3 had an open floor plan and were used for storage of a large amount of fabric and other materials. 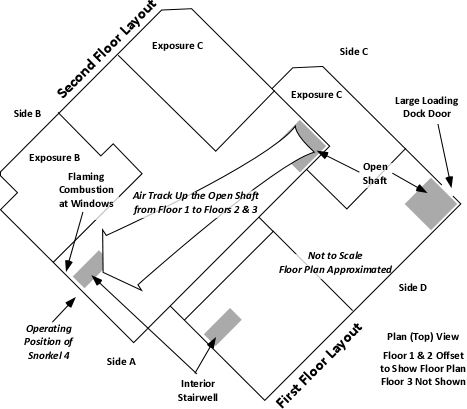 As illustrated in Figure 1, there were two means of access to Floors 2 and 3; a stairway on Side A and an open shaft and stairway on Side C.
Due to heavy fire involvement, operations focused on a predominantly defensive strategy to control the fire in this multi-occupancy commercial building. The incident commander called for a second, and then third alarm. Defensive operations involved use of handlines and an aerial ladder working from Side A and in the Side A stairwell leading to Floor 2. However, application of water from the ladder pipe had limited effect (possibly because of the depth of the building and burning contents shielded from direct application from the elevated stream. 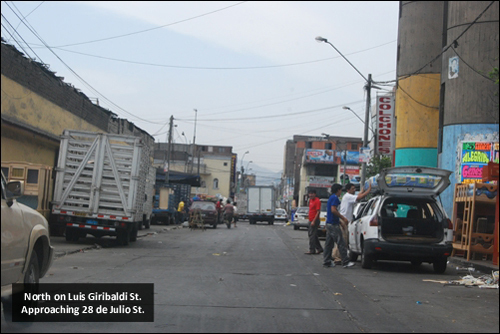 Note: Video screen shot from the intersection of Luis Giribaldi and 28 de Julio. The third alarm at 14:05 hours brought two engines and articulating boom aerial platform (Snorkel) from Lima 4 to the incident. Snorkel 4, under the command of Captain Roberto Reyna was tasked to replace the aerial ladder which had been operating on Side A and operate an elevated master stream to control the fire on Floor 2 (Figure 2). Placing their master stream into operation Teniente Oscar Ruiz and Captain Roberto Reyna worked to darken the fire on Floor 2. As exterior streams were having limited effect, Snorkel 4 was ordered to discontinue operation and began to lower the bucket to the ground. At the same time, efforts were underway to gain access to the building from Side C. Using forcible entry tools, firefighters breached the large loading dock door leading to the vertical shaft and stairwell in the C/D quadrant of the building. Prior to opening the large loading dock door on Side C (Charlie/Delta Corner), a predominantly bi-directional air track is visible at ventilation openings on Side C. Flaming combustion from windows on Side A was likely limited to the area at openings with a bidirectional air track. Combustion at openings on Side A likely consumed the available atmospheric oxygen, maintaining extremely ventilation controlled conditions with a high concentration of gas phase fuel from pyrolyzing synthetic fabrics deeper in the building. The ventilation profile when Snorkel 4 initially began operations included intake of air through the open interior stairwell (inward air track) serving floors 1-3 and from the lower area of windows which were also serving as exhaust openings (bi-directional air track). Interview of members operating at the incident indicates that there were few if any ventilation openings (inlet or exhaust) on Sides B, C, or D prior to creation of an access opening on Floor 1 Side C.
At approximately 15:50, Snorkel 4 was ordered to stop flowing water. As smoke conditions worsened, they did so and began to lower the aerial tower to the ground. At the same time, crews working to gain access to Floor 1 on Side C, breached the large loading dock door. A strong air track developed, with air rushing in the large opening and up the open vertical shaft leading to the upper floors as illustrated in Figure 3. As the Snorkel was lowered to the ground, Teniente Oscar Ruiz observed a change in smoke conditions, observing a color change from gray/black to “phosphorescent yellow” (yellowish smoke can also be observed in the video clip of this incident). 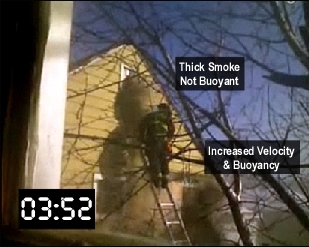 Less than two minutes after the change in ventilation profile, a violent backdraft occurred, producing a large fireball that engulfed Captain Roberto Reyna and Teniente Oscar Ruiz in Snorkel 4 (see Figure 4). 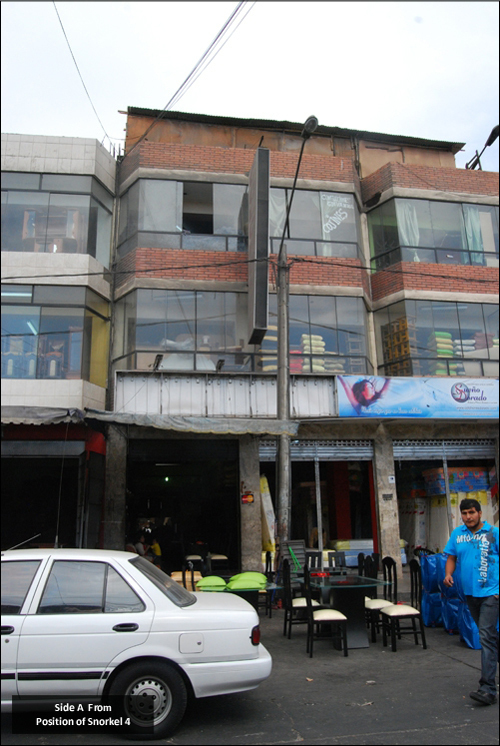 The blast seriously injured the crew of Snorkel 4 along with numerous other members from stations Lima 4, Salvadora Lima 10, and Victoria 8 who were located in the Stairwell (these members were blown from the building) and on the exterior of Side A. This incident eventually progressed to a fifth alarm with 63 companies from 26 of Lima’s 58 stations in attendance. Watch the video again; keeping in mind the changes in air track that resulted from breaching the loading dock door on Side C. Consider the B-SAHF (Building, Smoke, Air Track, Heat, and Flame) indicators that are present as the video progresses. The building involved in this incident is still standing and while it has been renovated, is much the same as it was in 1997. On December 6, 2010, Teniente Brigadier Giancarlo Passalaqua, myself and Capitáin Jordano Martinez went to Luis Giribaldi and 28 de Julio to walk the ground and gain some insight into this significant incident. 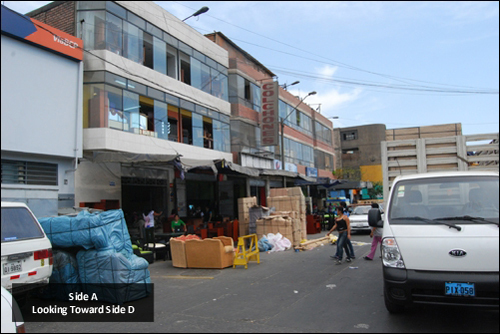 As illustrated in Figure 5, Luis Giribaldi Street is a one-way street with parking on both sides and overhead electrical utility lines. There are a number of obvious structural changes that have been made since the fire. Including installation of window glazing flush with the surface of the building (the original windows can be seen behind these outer windows). Figure 7 shows the view from Snorkel 4’s position, just to the left of center is the entry way leading to the stairwell used to access Floors 2 and 3. Piled fabric and other materials can be seen through the windows of Floors 2 and 3, likely similar in nature to conditions at the time of the incident. Figure 8 provides a view of Side A and Exposure B, which appears to be of newer construction and having a different roofline than the fire building. The appearance of the left and right sides of the fire building are different, but this is simply due to differences in masonry veneer on the exterior of the building. As illustrated in Figures 10-11 this block is comprised of several attached, fire resistive buildings. It is difficult to determine the interior layout from the exterior as there are numerous openings in interior walls due to renovations and changes in occupancy over time. The floor plan illustrated in Figure 4 is the best estimate of conditions at the time of the fire based on interviews with members operating at the incident. Figure 12shows Side C of the fire building and Exposure C and the loading dock door that was breached to provide access to the fire building from Side C immediately prior to the backdraft. Figure 13illustrates the proximity of Exposure D, a three-story, fire-resistive apartment building. This incident presented a number of challenges including a substantial fuel load (in terms of both mass and heat of combustion), fuel geometry (e.g., piled stock), and configuration (e.g., shielded fire, difficult access form Side C). Analysis of data from the short video clip and discussion of this incident with those involved provides a number of important lessons. Knowledge of the buildings in your response area is critical to safe and effective firefighting operations. 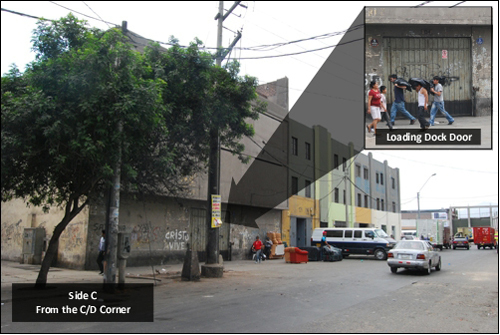 While a challenging task, particularly in a large city such as Lima, developing familiarity with common building types and configurations and pre-planning target hazards can provide a significant fireground advantage. Reading the fire is essential to both initial size-up and ongoing assessment of conditions. In this incident, fire behavior indicators may have provided important cues needed to avoid the injuries that resulted from this extreme fire behavior event. Some fire behavior indicators can be observed from one position, while others may not. It is particularly important that individuals in supervisory positions be able to integrate observations from multiple perspectives when anticipating potential changes in fire behavior. Any opening, whether created for tactical ventilation or for entry has the potential to change the ventilation profile. It is important to consider potential changes in fire behavior that may result from changes in ventilation (particularly when the fire is ventilation controlled). Communication and coordination are critical during all fireground operations. It is essential to communicate observations of key fire behavior indicators and changes in conditions to Command. Tactical ventilation (or other tactical operations that may influence fire behavior) must be coordinated with fire attack. Protective clothing and self-contained breathing apparatus are a critical last line of defense when faced with extreme fire behavior (even when engaged in exterior, defensive operations). I would like to recognize the members of the Peruvian fire service who assisted in my efforts to gather information about this incident and identify the important lessons learned. In particular, I would like to thank Teniente Brigadier Giancarlo Passalaqua, Brigadier CBP Oscar Ruiz, and my brothers at Lima 4 who generously shared their home, their time, and their knowledge. What is similar about these incidents and what is different? Based on the limited information currently available, what phenomena do you think occurred in each of the cases? What leads you to this conclusion? What indicators might have pointed to the potential for extreme fire behavior in each of these incidents? How might building construction have influenced fire dynamics and potential for extreme fire behavior in these incidents? What hazards are presented by fires in attics/truss lofts and what tactics may be safe and effective to mitigate those hazards? The most obvious similarities between these incidents was that the buildings were of wood frame construction, the fire involved or extended to an attic or truss loft void space, and that some type of extreme fire behavior occurred. In two of the incidents firefighters were seriously injured, while in the other firefighters escaped unharmed. Given the limited information available from news reports and photos taken after the occurrence of the extreme fire behavior events, it is not possible to definitively identify what types of phenomena were involved in these three incidents. However, it is interesting to speculate and consider what conditions and phenomena could have been involved. It might be useful to examine each of these incidents individually and then to return to examine fire behavior indicators, construction, and hazards presented by these types of incidents. In the Minneapolis incident the fire occurred in an older home with legacy construction and relatively small void spaces behind the knee walls and above the ceiling on Floor 3. The triggering event for the occurrence of extreme fire behavior is reported to be opening one of the knee walls on Floor 3. As illustrated in Figure 1, the fire appeared to transition quickly to a growth stage fire (evidenced by the dark smoke and bi-directional air track from the windows on Floor 3 Side A. However blast effects on the structure are not visible in the photo and were not reported. Potential Influencing Factors: While detail on this specific incident is limited, it is likely that the fire burning behind the knee wall was ventilation controlled and increased ventilation resulting from opening the void space resulted in an increase in heat release rate (HRR). Potential exists for any compartment fire that progresses beyond the incipient stage to become ventilation controlled. This is particularly true when the fire is burning in a void space. Extreme Fire Behavior: While statements by the fire department indicate that opening the knee wall resulted in occurrence of flashover, this is only one possibility. As discussed in The Hazard of Ventilation Controlled Fires and Fuel and Ventilation, increasing ventilation to a ventilation controlled fire will result in increased HRR. Increased HRR can result in a backdraft (if sufficient concentration of gas phase fuel is present), a vent induced flashover, or simply fire gas ignition (such as rollover or a flash fire) without transition to a fully developed fire. The Harrisonburg incident involved extreme fire behavior in Exposure D (not the original fire unit). The extreme fire behavior occurred after members had opened the ceiling to check for extension. However, this may or may not have been the precipitating event. 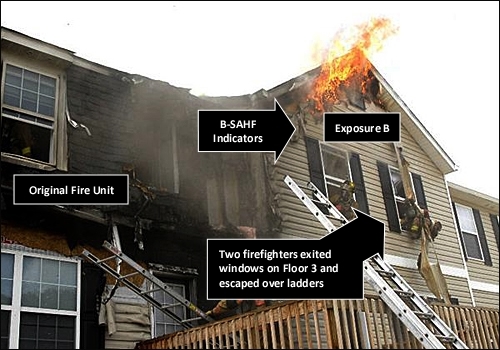 As illustrated in Figure 2, as members prepare to exit from the windows on Floor 3 , Side C, flames are visible on the exterior at the gable, but it appears that combustion is limited to the vinyl siding and soffit covering. There are no indicators of a significant fire in Exposure D at the time that the photo was taken. However, it is important to remember that this is a snapshot of conditions at one point in time from a single perspective. Potential Influencing Factors: The truss loft was likely divided between units by a 1 hour fire separation (generally constructed of gypsum board over the wood trusses). While providing a limited barrier to fire and smoke spread, it does not generally provide a complete barrier and smoke infiltration is likely. Sufficient smoke accumulation remote from the original fire location can present risk of a smoke explosion (see NIOSH Report 98-03 regarding a smoke explosion in Durango, Colorado restaurant). Alternately, fire extension into the truss loft above an exposure unit can result in ventilation controlled fire conditions, resulting in increased HRR if the void is opened (from above or below). Extreme Fire Behavior: Smoke, air track, and flame indicators on Side C indicate that the fire in the truss loft may not have continued to develop past the initial ignition of accumulated smoke (fuel). It is possible that smoke accumulated in the truss loft above Exposure B and was ignited by subsequent extension from the fire unit. Depending on the fuel (smoke)/air mixture when flames extended into the space above Exposure B ignition could have resulted in a smoke explosion or a less violent fire gas ignition such as a flash fire. In the Sandwich incident, the extreme fire behavior occurred shortly after the hose team applied water to the soffit. However, this may or may not have been the precipitating event. As illustrated in Figure 3, the fire transitioned to a fully developed fire (likely due to the delay in suppression as the injured members were cared for). Blast effects on the structure are obvious. Potential Influencing Factors: The roof support system in this home appears to have been constructed of larger dimensional lumber (rather than lightweight truss construction). In addition, it is likely that the attic void spaces involved in this incident were large and complex (given the size of the dwelling and complex roof line). It appears that at least part of the home had a cathedral ceiling. Fire burning in the wood framing around the metal chimney would have allowed smoke (fuel) and hot gases to collect in the attic void in advance of fire extension. 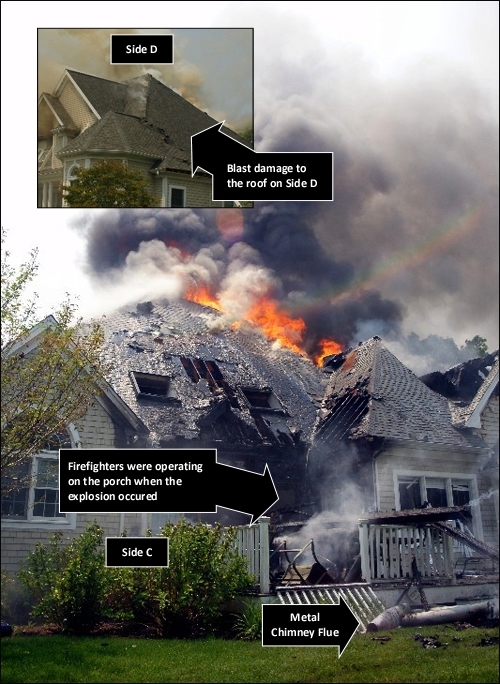 Extreme Fire Behavior: The violence of the explosion (see blast damage to the roof on Side D in Figure 3) points to the potential for ignition of pre-mixed fuel (smoke) and air, resulting in a smoke explosion. However, it is also possible that failure of an interior ceiling (due to water or steam production from water applied through the soffit) could have increased ventilation to a ventilation controlled fire burning in the attic, resulting in a backdraft). The information provided in news reports points to limited indication of potential for extreme fire behavior. One important question for each of us is how we can recognize this potential, even when indicators are subtle or even absent. Important! A growth stage fire can present significant smoke and air track indicators, with increasing thickness (optical density), darkening color, and increasing velocity of smoke discharge. However, as discussed in The Hazard of Ventilation Controlled Fires, when the fire becomes ventilation controlled, indicators can diminish to the point where the fire appears to be in the incipient stage. This change in smoke and air track indicators was consistently observed during the full-scale fire tests of the influence of ventilation on fires in single-family homes conducted by UL earlier this year. Even with an opening into another compartment or to the exterior of the building, a compartment fire can become ventilation controlled. Consider building factors including potential for fire and smoke extension into void spaces in assessing fire conditions and potential for extreme fire behavior. A ventilation controlled fire or flammable mixture of smoke and air may be present in a void space with limited indication from the exterior or even when working inside the structure. Each of these incidents occurred in a wood frame structure. However, the construction in each case was somewhat different. In Minneapolis, the house was likely balloon frame construction with full dimension lumber. As with many other structures with a “half-story”, the space under the pitched roof is framed out with knee walls to provide finished space. This design is not unique to legacy construction and may also be found with room-in-attic trusses. The void space behind the knee wall provides a significant avenue for fire spread. When involved in fire, opening this void space can quickly change fire conditions on the top floor as air reaches the (likely ventilation controlled) fire. The incident in Harrisonburg involved a fire in a townhouse with the extreme fire behavior phenomena occurring in an exposure. While not reported, it is extremely likely that the roof support system was comprised of lightweight wood trusses. In addition, there was a reverse gable (possibly on Sides A and C) that provided an additional void. As previously indicated, the truss loft between dwelling units is typically separated by a one-hour rated draft stop. Unlike a fire wall, draft stops do not penetrate the roof and may be compromised by penetrations (after final, pre-occupancy inspection). Installed to code, draft stops slow fire spread, but may not fully stop the spread of smoke (fuel) into the truss lofts above exposures. Firefighters in Sandwich were faced with a fire in an extremely large, wood frame dwelling. While the roof appeared to be supported by large dimensional lumber, it is likely that there were large void spaces as a result of the complex roofline. In addition, the framed out space around the metal chimney provided an avenue for fire and smoke spread from the lower level of the home to the attic void space. Forewarned is forearmed! Awareness of the potential for rapid fire development when opening void spaces is critical. Given this threat, do not open the void unless you have a hoseline in hand (not just nearby). Indirect attack can be an effective tactic for fires in void spaces. This can be accomplished by making a limited opening and applying water from a combination nozzle or using a piercing nozzle (which further limits introduction of air into the void). If there are hot gases overhead, cool them before pulling the ceiling or opening walls when fire may be in void spaces. Pulses of water fog not only cool the hot gases, but also act as thermal ballast; reducing the potential for ignition should flames extend from the void when it is opened. Lastly, react immediately and appropriately when faced with worsening fire conditions. Review my previous posts on Battle Drill (Part 1, Part 2, and Part 3). 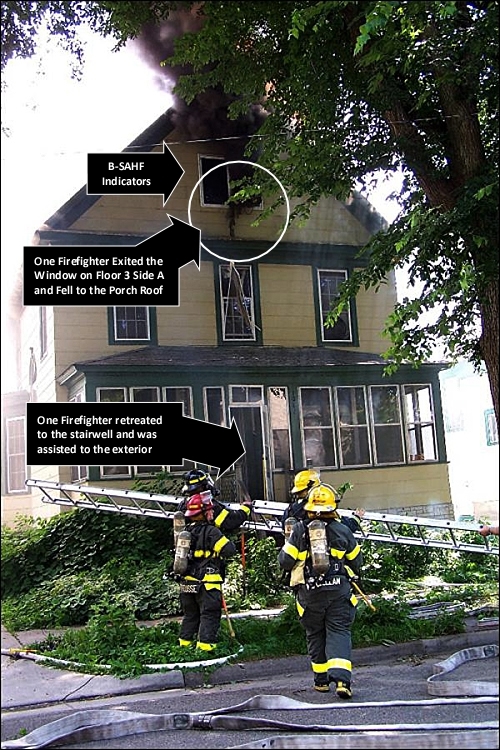 An immediate tactical withdrawal under the protection of a hoseline is generally safer than emergency window egress (particularly when ladders have not yet been placed to the window). It has been a number of months since the last Reading the Fire post. It is essential to continue the process of deliberate practice in order to continue to improve and refine skill in Reading the Fire. As we start the New Year it is a good time to reaffirm our commitment to mastering our craft. Developing and maintaining proficiency in reading the Fire using the B-SAHF (Building, Smoke, Air Track, Heat, and Flame) organizing scheme for fire behavior indicators, requires practice. 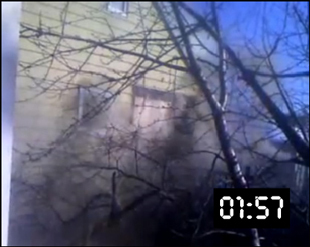 This post provides an opportunity to exercise your skills using a video segment shot during a residential fire. In mid-January 2010, the Gary, Indiana Fire Department was dispatched to a residential fire on Massachusetts Street at East 24th Avenue, on arrival Battalion 4 advised of a working fire in a 2 story dwelling. While the first arriving engine was laying a supply line from a nearby hydrant, the first in truck forced entry. Watch the first 35 seconds (0:35) of the video. This segment was shot from Side A. �First, describe what you observe in terms of the Building, Smoke, Air Track, Heat, and Flame Indicators; then answer the following five standard questions? What conditions would you expect to find inside this building? If presented with persons reported (as the first arriving companies were) how would you assess potential for victim survival? A voice heard in the video states that this was a backdraft. Do you agree? Why or why not? It is likely that the first in truck company in this incident made entry to search for occupants and to locate the fire. Regardless of your perspective on search with or without a hoseline, this video clip provides lessons. It is essential to read the fire, recognize the stage(s) of fire development and burning regime(s) in the involved compartments. In addition to reading current conditions, anticipate likely fire development and potential for extreme fire behavior. Making entry (and leaving the door fully open) creates a ventilation opening (inlet, exhaust, or both). Recognize the potential influence of changes to the ventilation profile on fire behavior. To borrow a phrase from a number of National Institute for Occupational Safety and Health Death in the Line of Duty reports; �Ventilation and fire attack must be closely coordinated�. One key element in this coordination is that charged lines must be in place before completion of ventilation openings. This is critical when dealing with a ventilation controlled fire. 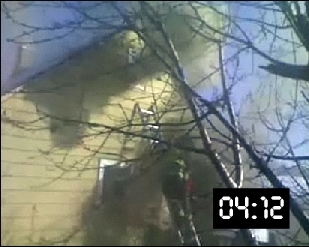 The previous post in this series presented a video clip of an incident on the afternoon of February 18, 2010 that injured four Chicago firefighters during operations at a residential fire at 4855 S. Paulina Street. First arriving companies discovered a fire in the basement of a 1-1/2 story, wood frame, single family dwelling and initiated fire attack and horizontal ventilation of the floors above the fire. Based on news accounts, the company assigned to fire attack was in the stairwell and another firefighter was performing horizontal ventilation of the floors above the fire on Side C when a backdraft or smoke explosion occurred. Two firefighters on the interior, on at the doorway and the firefighter on the ladder on Side C were injured and were transported to local hospitals for burns and possible airway injuries. In analyzing the video clip shot from inside a nearby building, we have several advantages over the firefighters involved in this incident. Time: We are not under pressure to make a decision or take action. Reduced Cognitive Workload: Unlike the firefighters who needed to not only read the fire, but also to attend to their assigned tactics and tasks, our only focus is analysis of the fire behavior indicators to determine what (if any) clues to the potential for extreme fire behavior may have been present. Repetition: Real life does not have time outs or instant replay. However, our analysis of the video can take advantage of our ability to pause, and replay key segments, or the entire clip as necessary. 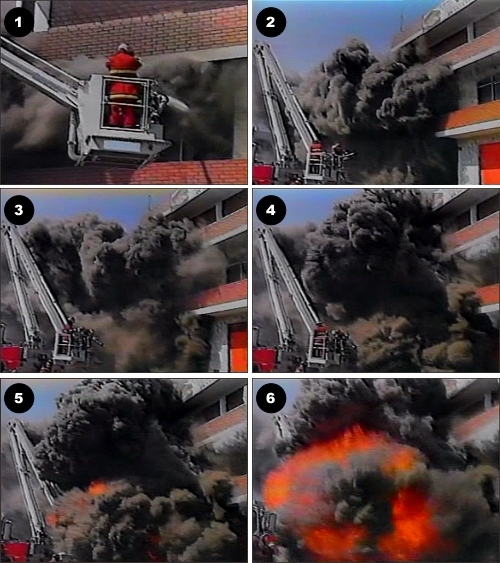 Perspective: Since the field of view in the video clip is limited by the window and the fidelity of the recording is less than that seen in real life, it presents a considerably different field of view than that of the firefighters observed in operation and does not allow observation of fire behavior indicators and tactical operations on Sides A, B, and D.
What B-SAHF indicators could be observed on Side C up to the point where firefighters began to force entry and ventilate the basement (approximately 02:05)? Building: The structure is a 1-1/2 story, wood frame, dwelling with a daylight basement. The apparent age of the structure makes balloon frame construction likely, and the half story on the second floor is likely to have knee walls, resulting in significant void spaces on either side and a smaller void space above the ceiling on Floor 2. One window to the left of the door on Side C appears to be covered with plywood (or similar material). Given the location of the door (and door on Side A illustrated in the previous post in this series), it is likely that the stairway to the basement is just inside the door in Side C and a stairway to Floor 2 is just inside the door on Side A. Smoke: A moderate volume of dark gray smoke is visible from the Basement windows and windows and door on Floor 1 as well as a larger volume from above the roofline on Side B. While dark, smoke on Side C does not appear to be thick (optically dense), possibly due to limited volume and concentration while smoke above the roofline on Side B appears to be thicker. However smoke on Side C thickens as time progresses, particularly in the area of the door on Floor 1. The buoyancy of smoke is somewhat variable with low buoyancy on Side C and greater buoyancy on Side B. However, smoke from the area of the door on Floor 1 Side C intermittently has increased buoyancy. Air Track: Smoke on Side C appears to have a faintly pulsing air track with low velocity which is masked to some extent by the effects of the wind (swirling smoke due to changes in low level wind conditions). Smoke rising above the roofline on Side B appears to be moving with slightly greater velocity (likely due to buoyancy). Heat: The only significant heat indicators are limited velocity of smoke discharge and variations in buoyancy of smoke visible from Sides B and C. Low velocity smoke discharge and low buoyancy of the smoke on Side C points to relatively low temperatures inside the building. The greater buoyancy and velocity of smoke observed above the roofline on Side B indicates a higher temperature in the area from where this smoke is discharging (likely a basement window on Side B). Flame: No flames are visible. Based on assessment of conditions to this point, what stage(s) of development and burning regime(s) is the fire likely to be in? Dark smoke with a pulsing air track points to a ventilation controlled, decay stage fire. What conditions would you expect to find inside the building? Floors 1 and 2 are likely to be fully smoke logged (ceiling to floor) with fairly low temperature. The basement is likely to have a higher temperature, but is also likely to be fully smoke logged with limited flaming combustion. How would you expect the fire to develop over the next few minutes? What indicators could be observed while the firefighter was forcing entry and ventilating the daylight basement on Side C (02:05-02:49)? 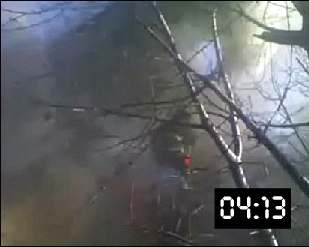 There are few changes to the fire behavior indicators during this segment of the video. Building, Heat, and Flame indicators are essentially unchanged. Smoke above the roofline appears to lighten (at least briefly) and smoke on Side C continues to show limited buoyancy with a slightly pulsing air track at the first floor doorway. What B-SAHF indicators can be observed at the door on Side C prior to forced entry (02:49-03:13)? Building, Smoke, Heat and Flame indicators remain the same, but several more pulsations (03:05-03:13) providing a continuing, and more significant indication of ventilation controlled, decay stage fire conditions. What indicators can be observed at the door while the firefighter attempts to remove the covering over the window adjacent to the door on Floor 1 (03:13-13:44)? No significant change in Building, Heat, or Flame Indicators. However, smoke from the doorway has darkened considerably and there is a pronounced pulsation as the firefighter on the ladder climbs to Floor 2 (03:26). It is important to note that some of the smoke movement observed in the video clip is fire induced, but that exterior movement is also significantly influenced by wind. What B-SHAF indicators do you observe at the window on Floor 2 prior to breaking the glass (03:44)? The window on Floor 2 is intact and appears to be tight as there is no smoke visible on the exterior. It is difficult to tell due to the angle from which the video was shot (and reflection from daylight), but it would be likely that the firefighter on the ladder could observe condensed pyrolizate on the window and smoke logging on Floor 2. It is interesting to note limited smoke discharge from the top of the door and window on Floor 1 in the brief period immediately prior to breaking the window on Floor 2. What indicators are observed at the window on Floor 2 immediately after breaking the glass (03:44-03:55)? No significant changes in Building, Heat, or Flame indicators. Dark gray smoke with no buoyancy issues from the window on Floor 2 with low to moderate velocity immediately after the window is broken. What B-SAHF indicators were present after the ventilation of the window on Floor 2 Side C was completed and 04:08 in the video clip (03:44-04:08)? Buoyancy and velocity both increase and a slight pulsing air track develops within approximately 10 seconds. In addition, the air track at the door on Floor 1 shifts from predominantly outward with slight pulsations to predominantly inward, but with continued pulsation (possibly due to the limited size of the window opening on Floor 2, Side C.
Unlike the firefighters in Chicago who were operating at this incident, we can hit the pause button and consider the indicators observed to this point. Think about what fire behavior indicators are present (and also consider those that are not!). Initial observations indicated a ventilation controlled decay stage fire and predicted fire behavior is an increase in heat release rate with potential for some type of extreme fire behavior. Possibilities include ventilation induced flashover (most likely) or backdraft (less likely), or smoke explosion (less likely than some type of ventilation induced extreme fire behavior). 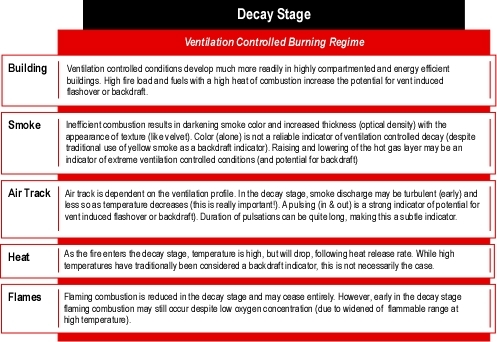 Take a minute to review the indicators of ventilation controlled, decay stage fires as illustrated in Table 1. Which of these indicators were present on Side C of 4855 S. Paulina Street? Building: The building appeared to be unremarkable, a typical single family dwelling. However, most residential structures have more than enough of a fuel load to develop the conditions necessary for a variety of extreme fire behavior phenomena. Smoke: The dark smoke with increasing thickness (optical density) is a reasonably good indicator of ventilation controlled conditions (particularly when combined with air track indicators). Lack of buoyancy indicated fairly low temperature smoke, which could be an indicator of incipient or decay stage conditions or simply distance from the origin of the fire. However, combined with smoke color, thickness, and air track indicators, this lack of buoyancy at all levels on Side C is likely an indicator of dropping temperature under decay stage conditions. This conclusion is reinforced by the increase in buoyancy after ventilation of the window on Floor 2 (increased ventilation precipitated increased heat release rate and increasing temperature). Air Track: Pulsing air track, while at times quite subtle and masked by swirling smoke as a result of wind, is one of the strongest indications of ventilation controlled decay stage conditions. While often associated with backdraft, this indicator may also be present prior to development of a sufficient concentration of gas phase fuel (smoke) to result in a backdraft. 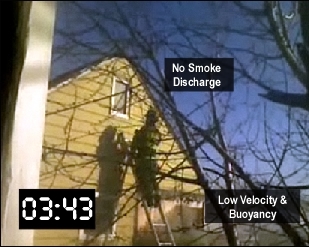 Heat: Velocity of smoke discharge (air track) and buoyancy (smoke) are the only two heat indicators visible in this video clip. As discussed in conjunction with smoke indicators, low velocity and initial lack of buoyancy which increases after ventilation is indicative of ventilation controlled, decay stage conditions. Flame: Lack of visible flame is often associated with ventilation controlled decay and backdraft conditions. However, there are a number of incidents in which flames were visible prior to occurrence of a backdraft (in another compartment within the structure). Lack of flames must be considered in conjunction with the rest of the fire behavior indicators. 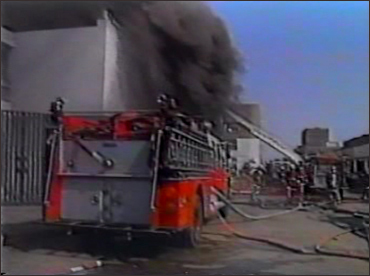 In this incident, lack of visible flames may be related to the stage of fire development, but more likely is a result of the location of the fire, as there is no indication that flames were present on Side C prior to the start of the video clip. Firefighters had entered the building for fire attack while as illustrated in the video clip, others were ventilating windows on Side C. It is difficult to determine from the video if a window or door at the basement level on Side C was opened, but efforts were made to do so. A window on Floor 2 had been opened and firefighters were in the process of removing the covering (plywood) from a window immediately adjacent to the door on Floor 1. At 04:12, an explosion occurred, injuring two firefighters on the interior as well as the two firefighters engaged in ventilation operations on Side C.
Starting at approximately 03:59, velocity of smoke discharge from the window on Floor 2 Side C increases dramatically. 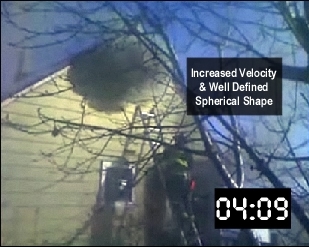 At 04:08 discharge of smoke begins to form a spherical pattern as discharged from the window. 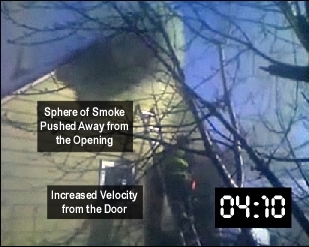 This pattern becomes more pronounced as the sphere of smoke is pushed away from the window by increasing velocity of smoke discharge at 04:12, immediately prior to the explosion. Velocity of smoke discharge at the door increases between 03:59 and -4:12 as well, but as the opening is larger, this change is less noticeable. As pressure increases rapidly during the explosion a whooshing sound can be heard. After the explosion, there was no noticeable increase in fire growth. Based on observation of fire behavior indicators visible in the video clip, we know that a transient extreme fire behavior event occurred while a crew was advancing a hoseline on the interior and ventilation operations were being conducted on Side C. What we don�t know is what firefighting operations were occurring on the other sides of the building or in the interior. In addition, we do not have substantive information from the fire investigation that occurred after the fire was extinguished. The Ontology of Extreme Fire Behavior presented in an earlier post classifies these types of phenomena on the basis of outcome and conditions. As a transient and explosive event, this was likely a backdraft or smoke explosion. In that this occurred following entry and during ongoing ventilation operations, I am inclined to suspect that it was a backdraft. Indicators visible on Side C provided a subtle warning of potential for some type of ventilation induced extreme fire behavior, but were likely not substantially different from conditions observed at many fires where extreme fire behavior did not occur. As the title of the wildland firefighting course S133 states; Look Up, Look Down, Look Around! Anticipation of fire development and extreme fire behavior requires not only recognition of key indicators, but that these indicators be viewed from a holistic perspective. Firefighters and/or officers performing a single task or tactical assignment may only see part of the picture. It is essential that key indicators be communicated to allow a more complete picture of what is occurring and what may occur as incident operations progress. Two recent events in Baltimore, Maryland and Gary, Indiana point to the criticality of recognizing key fire behavior indicators and understanding practical fire dynamics. Early on the morning of Friday, January 15, 2010, the Baltimore City Fire Department was dispatched to a residential fire Southeast Baltimore. First arriving companies observed a row house of ordinary construction with a large volume of smoke and flames issuing from the basement and extending to the first floor. According to a department spokesperson, the first engine took a line through the front door to the rear kitchen area where crew had some trouble finding the basement stairs. Another engine company went to the rear with a line to the outside stairwell leading to the basement and was just starting down the stairs. The first truck vented some skylights on the roof as well as the front basement windows. As crews were attempting to access the fire, some type of transient extreme fire behavior resulted in flames blowing through the unit and out the front door, rear stairwell, second floor windows, and skylights. The firefighter from the first arriving truck assigned to the roof described the sound of a freight train coming through. As always when a video of an incident involving extreme fire behavior is posted to the web, there is ongoing debate about what happened. Was it a backdraft? Was it a flashover? An interesting debate, but the value is not so much in being �right�, but in understanding how these phenomena occur, what might have happened in this incident, key indicators that may (or may not) be visible in the video, and most importantly how to prevent this from happening to us and the firefighters that we work with! Flashover: sudden transition to fully developed fire. This phenomenon involves a rapid transition to a state of total surface involvement of all combustible material within the compartment. Given adequate fuel and ventilation, a compartment fire may reach flashover as it develops from the growth to fully developed stage. However, when fire development is limited by the ventilation profile of the compartment, changes in ventilation will directly influence fire behavior. For many years firefighters have been taught that ventilation reduces the potential for flashover. However, when a fire is ventilation controlled, heat release rate is limited by the available oxygen. Under these conditions; increasing air supply by creating opening results in increased heat release rate. This increased heat release rate may result in flashover. If a fire is sufficiently ventilation controlled and a high concentration of excess pyrolizate and unburned flammable products of combustion accumulate in a compartment, the outcome of increased ventilation may be different. Backdraft: Deflagration of unburned pyrolyzate and combustion products following introduction of air to a ventilation controlled compartment fire and ignition of the fuel/air mixture. This deflagration results in a rapid increase in pressure within the compartment and extension of flaming combustion through compartment openings. Occurrence of this phenomenon requires an atmosphere in which the fuel concentration is too high to deflagrate without introduction of additional oxygen. Figure 1. 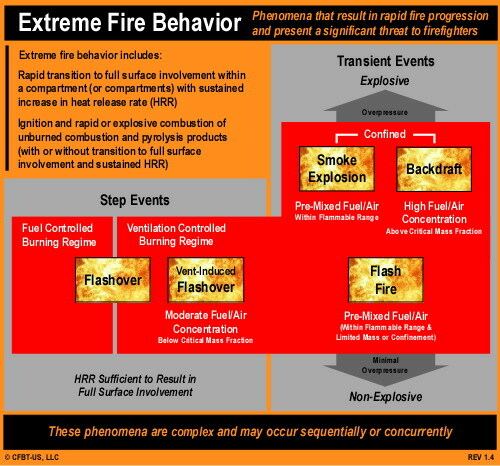 Extreme Fire Behavior Classification. Use of this approach may aid in making sense of what may have occurred in the Baltimore incident. But, it is often difficult to classify extreme fire behavior phenomena into discrete, black and white categories. What is the dividing line between a ventilation induced flashover and a backdraft. One key difference may be the speed with which heat release rate increases, but where is the dividing line (see Figure 2)? Figure 2. The Gray Area. Keep in mind that while being right is great, it is more important to work through the process of figuring things out to improve your understanding. Monday morning January 18, 2010 firefighters in Gary, Indiana were operating at a residential fire at 24th and Massachusetts when they experienced a near miss involving rapid fire progression. Have a look at video of this incident and give some thought to what influenced fire behavior. Also look at the similarities and differences between the extreme fire behavior that occurred in the Baltimore and Gary incidents. I have been extremely busy working on a project for the National Institute for Occupational Safety and Health and preparing for the International Fire & Rescue Congress in Valdivia, Chile. Next week�s post will provide a quick update on training conducted at the Congress. After returning from Chile, I will be back on task with examination of the concept of battle drills to develop effective reaction to worsening fire conditions while operating in an offensive mode.